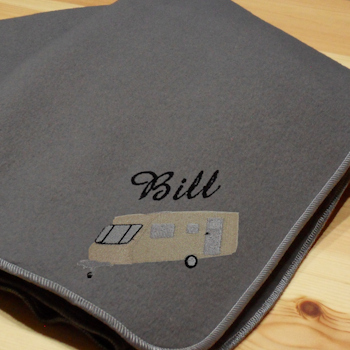 Personalised caravan throw blanket in soft polar fleece fabric made and embroidered in the UK. Choose your blanket size, we can make you a Single 100x150 cm or a Double size 200x150 cm. Choose your blanket size, we can make you a Single 100x150 cm or a Double size 200x150 cm. All sizes are measured approximate. The fleece blanket has overcast stitched edges and is made from good quality antipil polar fleece that is easy care polyester and is machine washable and air dry. Caravan motif embroidery is to one corner. We will beautifully embroider a name or brief message on the fleece. You choose the thread colour and font style for the text. Size: Single size 100x150 cm Double size 200x150 cm all sizes are approximate.